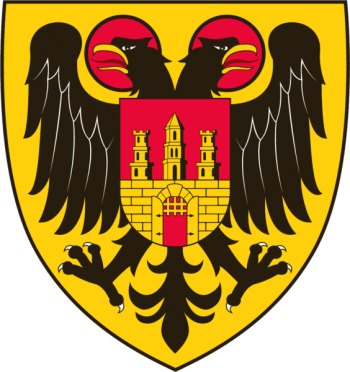 The lion is a reference to the arms of the Habsburgs, and the escutcheon is easily recognizable as the arms of Austria. The region was under Austrian control until 1806. It is possible that this grant of arms was part of an ongoing power struggle between the local lords and the counts in Scheer; the grant may have been a show of support for the lords from Emperor Leopold I. The arms are derived from the historical arms of the borough, recorded as far back as 1572; the three salmon refer to three fisheries mentioned in the Domesday Book. 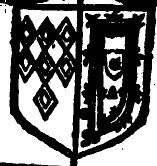 The escutcheon on the crest bears the arms of the Borough of Malden and Coombe, and the supporters’ escutcheons show the arms of the Borough of Surbiton. *Compartments are usually left to the discretion of the artist, not specified in the blazon. The escutcheon in the above arms seems to have been in use for a fairly long time (at least since 1932). The eagle seems to have come into use around 2010, though it is unclear why. The hammers are likely a reference to the importance of mining in the town’s history. Almadén was a major source of mercury and cinnabar since Roman times. Carlos III established an Academy of Mining in the region in 1777. The name of the town is derived from the Arabic “hisn al-ma’din”, or “fort of the mine.” The cross probably reflects Alfonso VII’s grant of the region to the Order of Calatrava in 1168. The vine motif seems to be extremely old, possibly dating back to 1331 or even earlier. It remains consistent across many different versions of the arms. 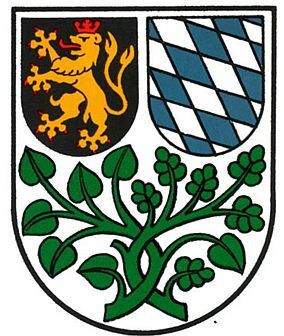 The escutcheons in the chief are probably derived from the arms of the Electoral Palatinate. The lion was the symbol of the County Palatine. The argent and azure fusils originally belonged to the Counts of Bogen, but were adopted by the House of Wittelsbach in 1247, and are often used for Bavaria. *I have not had any luck identifying the specific types of vines shown here. Most depictions of the arms do go out of their way to distinguish between the dexter and sinister vines, which is a good indication that they are intended to be different, but I cannot determine the exact species.